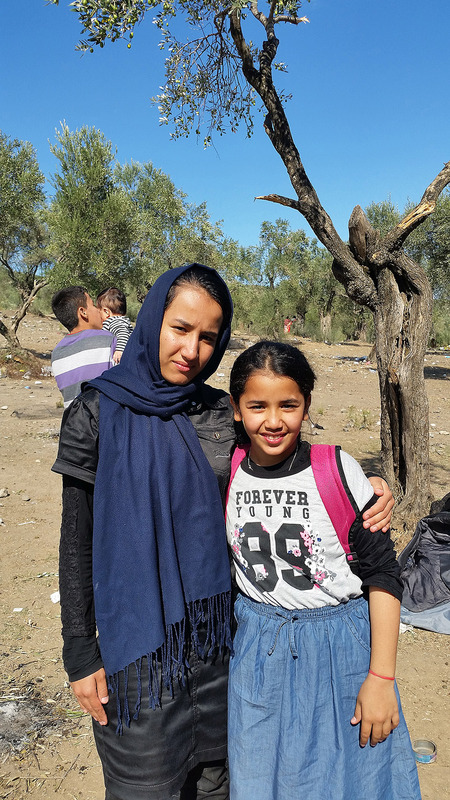 Mister Jafar has arrived to Lesbos on Tuesday with his whole family. They are 11 persons, children and adults. 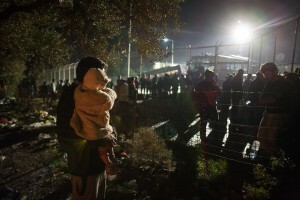 He reached Moria at 20:00 o’clock. “It is crucial that we could leave all together. How horrible is it to leave your beloved behind if their lives are in danger?” He is standing next to the queue for Non-Syrian families. With severe pain in his legs that draw back to an accident and multiple bone fractures the tall man with the crutches is not able to hold up against the pushing people in the row. 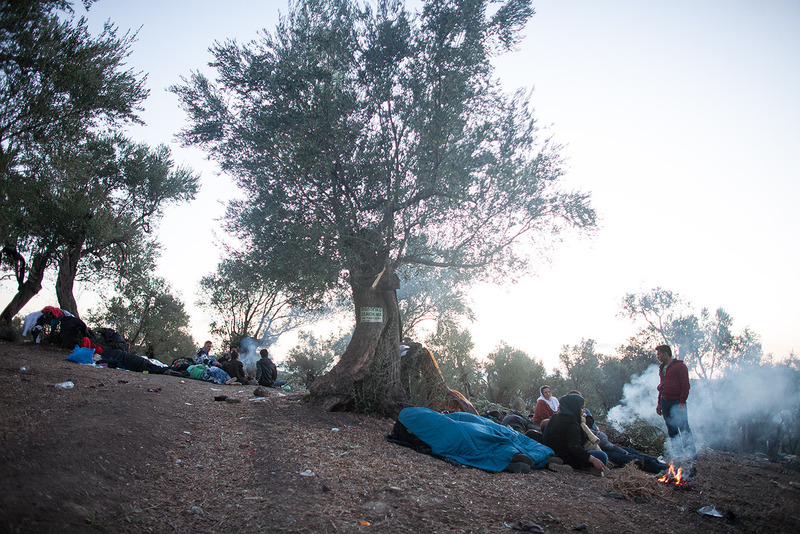 The women, teenagers and children of his family sleep aside in a field of olive trees which is strewn with garbage. Every here and there small groups of people have lit fires sitting nearby to warm themselves. In the dark one can see on the second sight bodies of the sleeping crunched in thin clothes, seldom in blankets or sleeping bags. Mr. Jafar watches the family line moving back and forth. Newcomers are pushing from the back and the side. Every now and then one can here shouting voices as small arguments raise out of the anxious cloud. The queue of the single men among which one can identify easily many underage boys, reaches half way down the hill. Upwards along the family queue women and men are standing in the mud as water continiously rinses from a water tap a few meters away. 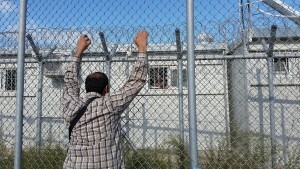 A young Afghan man is organizing both lines almost by himself. He is very busy. With a polite smile or in exchange a serious look he controls hundreds of people almost without shouting. Along the family queue he has constructed a human chain to control the crowd. “My wife is also in this queue. There are about 70 meters left between her and the gate. As long as we are outside I will help out here. And I really hope someone will take over as soon as I have to get in for registration.” He smiles. “You know what my profession is? I am a satellite engineer. I was organizing the queues in the ISAF camp in Afghanistan. 300 different nationalities of people. I know how to deal with people.” He has rolled up his sleeves as he seems feeling hot while constantly moving back and forth between the lines. Near the fence an old lady is sitting on a narrow stripe of dry earth waiting aside the queue. She is feeling cold. Suddenly her son appears. The ineloquent man lifts her slowly up and guides her over into the queue. She sits now on the dry cement floor leaning on the fence of the gate. 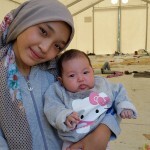 There are dozens of mothers waiting aside the queue and sitting with their babies in their arms on the floor. “Do you have something to eat? Do you have some water?” Two or three ask. Tonight no one has a tent. 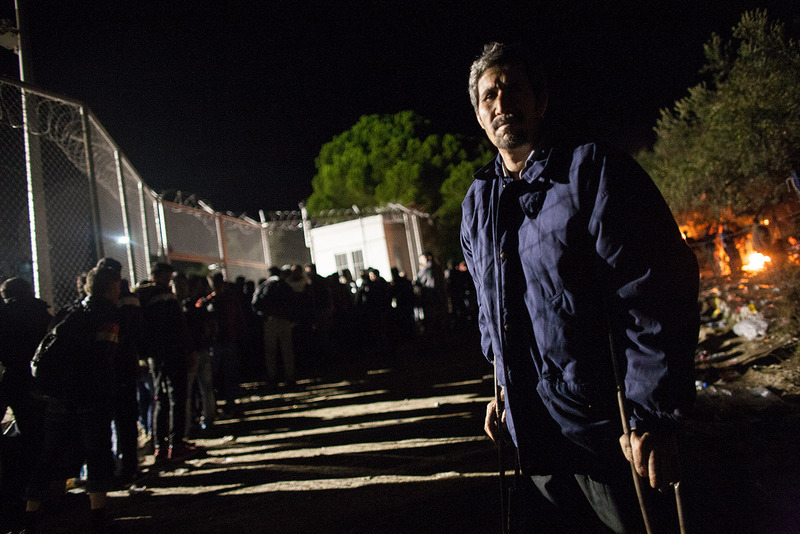 The people are not allowed to pass into Moria as long as they aren’t registered. The single men will not get the permission at all. 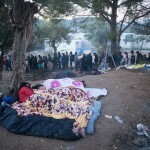 The tents inside the camp are long full with Syrian families. They can’t cover the needs of all. The next day – Wednesday – at 1pm Mr. Jafar finally gets out of the registration with his freshly printed documents. “We waited all night long. I didn’t close my eyes even for a minute.” He still seems better today. Many families of the night before are around. 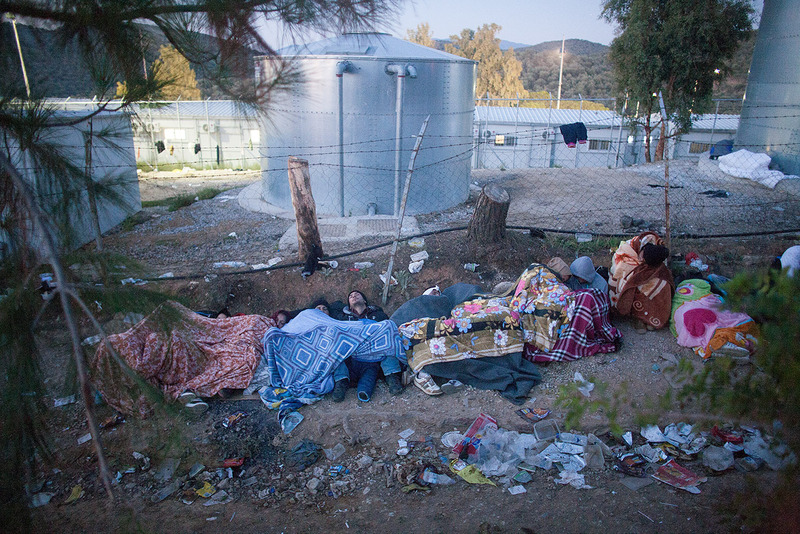 They all spent the night outside without access to toilettes, tents or food. 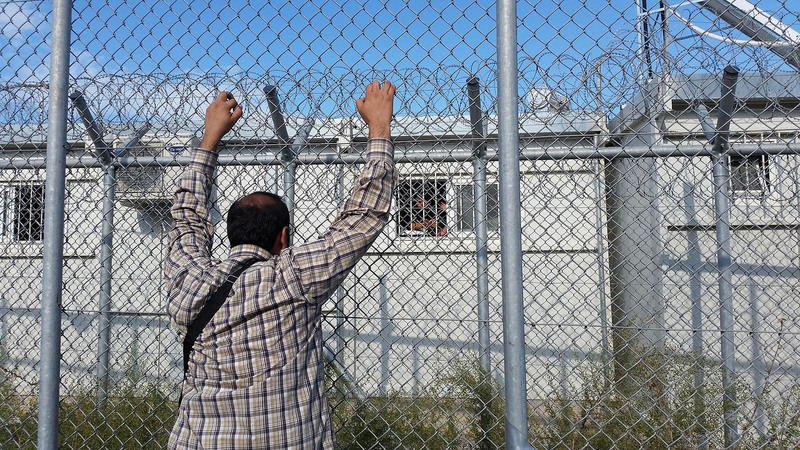 Meanwhile near the registration tract of the Syrians outside of the First Reception Centers gates a man is communicating through the fence to his nephew. 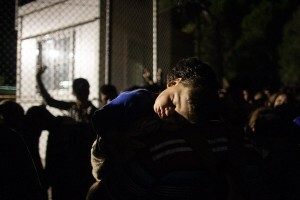 Authorities separated them as according to the law only parents are recognized as legal guardians. The two desperately try to plan how to find each other again after the uncertain period of about two weeks when the minor will be transferred to an open reception centre. 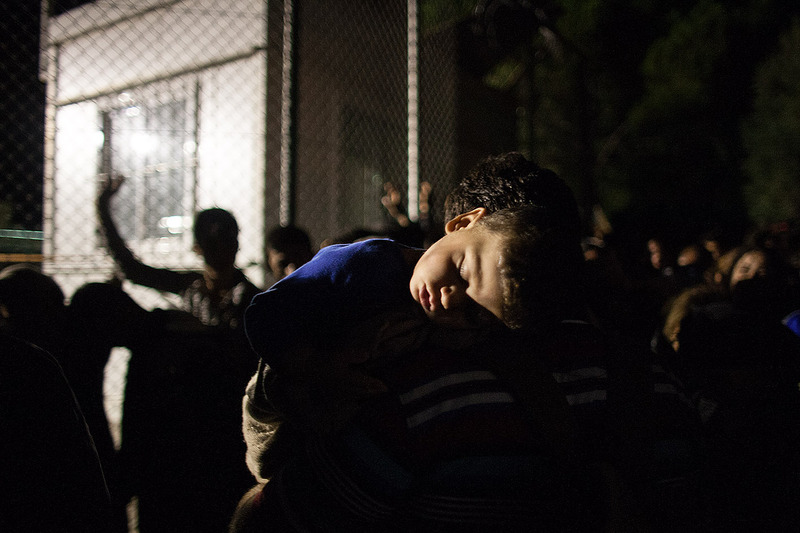 Registration procedures changed within the last days and an increasing number of unaccompanied minors gets identified, dozens get separated from their relatives as they do not travel with their core families. It is Thursday morning. 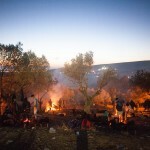 Kara Tepe camp gets successively more crowded. 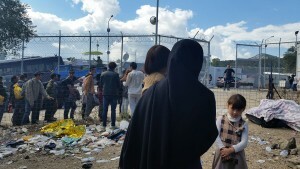 Hundreds of newly arriving Syrians are waiting for their transfer to Moria in order to get registered. The registration system is encountering again problems. 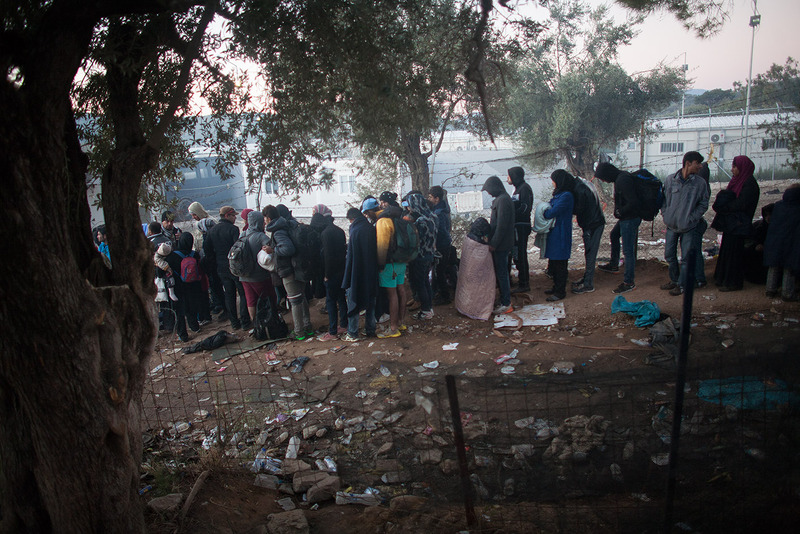 Busses stop for hours transporting refugees to the registration camp. 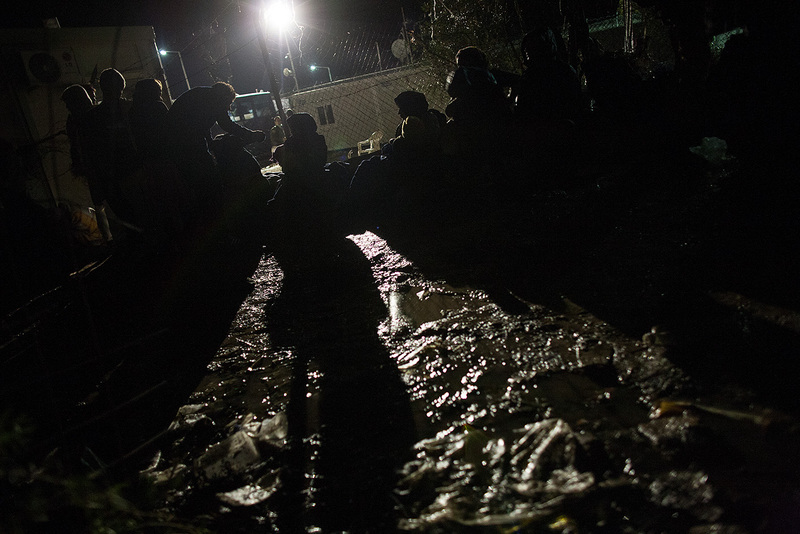 In the night the queue of the Non-Syrians on the backside of Moria has grown. Single men now stand in a line almost all the street down. Upwards the queue of the families leads along the dusty road deep into the fields. 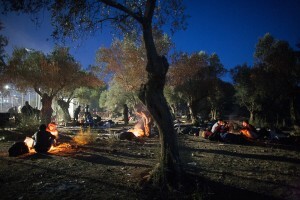 Many young men gave up and sit in the olive fields around fires to warm themselves. Some try to register since two days. 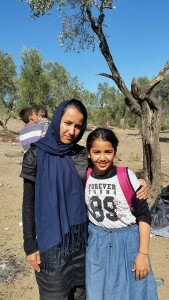 The families in front of the line say they wait since the morning at 4am when they arrived in Moria. Others say they are queueing since more than one day. “We had reached the front of the line when chaos broke out suddenly and we ended up again in the end of the queue. Our son is 1 month old. He is feverish. We didn’t sleep since several days. Around 5am registration seems to have halted. In the mens queue most people are sitting aside the road trying to sleep a few minutes. They sit near by each other, the heads resting on their arms while one is trying to warm the other. 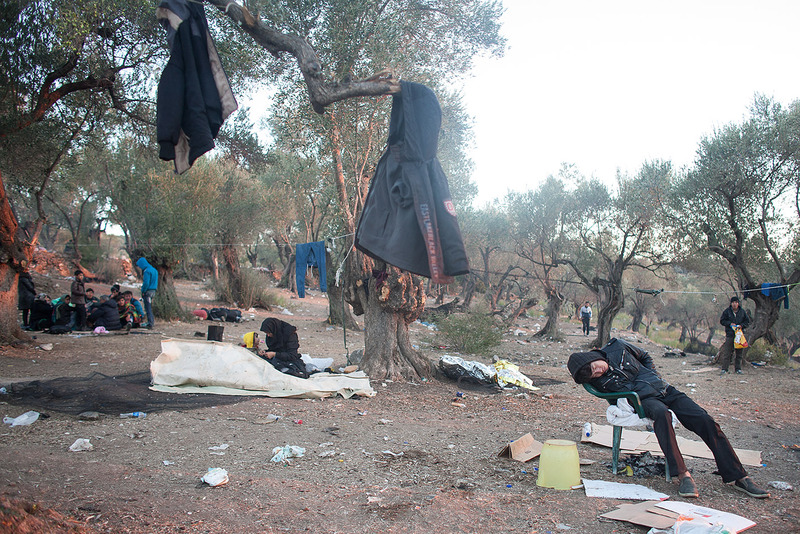 The whole road uphill is covered with bodies of the sleeping and waiting. In the very end of the family queue is a fire. Next to it there sits a family with a 2 months old baby. “When will they re-start registration they ask? We are cold. We are hungry. There is not even a toilette we can use,” the father says. 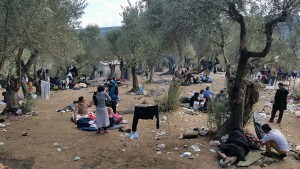 Hundreds of refugees are all over the area, fires and smoke mark the territory which is covered by garbage. Completely wet clothes are hanging over the fences trying to dry. Around 6am the police shift changes. With the arrival of the officers all the people wake up. Suddenly the whole line is moving. People stand up in hope to finally move on for some meters, to get some meters closer to the documents that will allow them to leave, but also to access toilettes, tents and doctors provided only for people inside the camp.